The Tánaiste and Minister for Justice has today published the Scheme of Judicial Appointments Commission Bill 2016 (press release | Scheme (pdf)) to deliver on the commitments in the Programme for a Partnership Government to reform the system for judicial appointments. The Scheme provides for a new Commission for Judicial Appointments, including a lay chair and a lay majority. The lay members of the Commission will be selected by the Public Appointments Service, which will also select the Chairperson. The Commission will make recommendations to the Government for appointment to judicial office, and a sub-committee of the Commission will prepare codes of practice dealing with selection processes. the necessity to apply, to the greatest extent possible, best international practice and relevant international instruments and conventions relating to judicial appointments. These are matters to which I will return at a later date on this blog; meantime, on the issue of diversity in principle 4, see Laura Cahillane “Judicial Diversity in Ireland” (2016) 6(1) IJLS 1 (pdf); 2016 IJLS.ie (html). (1) In this Head “legal academic” means a full-time, permanent member of the academic staff of an educational establishment mentioned in subsection (2). (d) an educational establishment providing education and training for the solicitors’ and barristers’ professions, as prescribed by the Minister on foot of recommendations made by the [Legal Services Regulatory] Authority pursuant to section 13* of the Legal Services Regulation Act 2015. 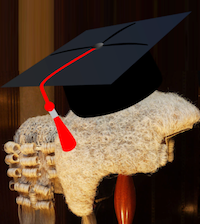 (3) The provisions of this Head shall only apply to a legal academic who has qualified as a barrister or as a solicitor, whether or not that person has practised as a solicitor or as a barrister. (5) A person of such standing will have been employed as a legal academic for a continuous period of not less than two years immediately before such appointment (4) a legal academic. (6) The Commission shall not recommend to the Minister for appointment to judicial office a legal academic unless he or she satisfies the requirements b., c., d., and e. of Head 22 and unless he or she has displayed in his or her role as legal academic a degree of competence and a degree of probity appropriate to and consistent with the appointment concerned. [* The text refers to section 12 of the Act, but this must be a typo for section 13. I have been arguing in favour of this development for quite some time (here, here, and here) and even went so far as to draft possible a legislative provision to achieve that end. This time last year, then-Senator Seán Barrett proposed that provision as an amendment to a Bill relating to the courts which was then before the Seanad. He withdrew the amendment when then-Minister of State at the Department of Justice and Equality, Aodhán Ó Ríordáin TD said that “the eligibility of legal academics for judicial appointment, is one of a wide range of matters included within the scope of the review” of judicial appointments then being considered by the Department. I was disappointed that no equivalent to Head 26 appeared in the Judicial Appointments Commission Bill 2016 published in October by Fianna Fáil, and I am thrilled that Head 26 is the result of the Department’s consideration on that issue. A quick comparison of Head 26 above and the 2015 amendment is instructive. The definitions of “legal academic” in sub-Head (1) above, and of “educational establishment” in sub-Head (2) above, are in exactly the same terms as those proposed in the 2015 amendment. Sub-Head (3) above is very similar to, and achieves exactly the same end, as the equivalent subsection in the 2015 amendment. Sub-Heads (4) (5) and (6) together constitute a much simpler means of achieving exactly the same ends as those proposed in the equivalent sections in the 2015 amendment. Those sections had to be drafted to amend a range of previous legislation, whereas the sub-Heads above can be shorter because they interoperate with other Heads of the Bill which replace and simplify the previous provisions, and they are all the better for that. This section addresses the position of legal academics attached to recognised institutions; some contributions to the consultations process note that it was an anomaly that persons with considerable experience in such areas as teaching in the law, legal research and as authors of academic legal texts could not be considered for appointment as judges. In some other jurisdictions experience as an academic in law fields in a university and similar institution is reckoned as relevant experience for the purpose of appointment to judicial office. I completely agree; and the day when my fellow academics are appointed to the Irish bench cannot come quickly enough.